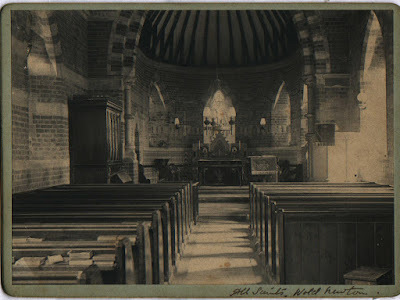 ... and here's one showing the church in the heyday of its anglo-catholic finery. To find out about services visit the A Church Near You website linked here. Robert Page's book, A History of the County of Lincoln vol 2, contains details of the village's connection to Louth Abbey in 1303. Part I AD 1705-1723 and a transcription of that record together with some comparative information from neighbouring parishes can be found be clicking here. The consecration of the new church on All Saints' Day 1862 by the Archbishop of Canterbury - reported in John Bull, 8th November 1862. Thomas a Beckett Venerated as a saint by both Anglicans and Roman Catholics. Gilbert of Sempringham A Lincolnshire man (from Sempringham near Bourne) and founder of the Gilbertine order. Imprisoned on suspicion of aiding Thomas a Beckett in one of his fallings out with Henry II but acquitted and lived to the age of 106. Francis of Assisi Founder of the Franciscan order (obviously) and patron saint of animals. Hubert Patron saint of hunting - of course!